Three years ago I attended a workshop with Will Allen, the former NBA basketball player turned inner city Milwaukee food advocate. His organization promotes small-scale food production in urban settings. One mainstay of their system is the production of “microgreens.” I came home with my flat of planted microgreen seeds, which the squirrels promptly slew all over my porch, and I gave up in discouragement. In the middle of this hot summer with no salad greens in sight, I tried again, but this time with delicious success. What’s the difference between sprouts, microgreens and baby greens? Sprouts are grown for their cotyledons (seed leaves), seeds and roots, and usually indoors without soil. Microgreens are grown outdoors, or indoors with light, on a thin layer of soil or organic fabric. They are harvested above ground when they are 1 to 2-inches tall with the seed leaves and sometimes the first true leaves. Baby greens are grown in soil outdoors or in a greenhouse and harvested above ground when they are slightly older, with more leaves. Sprouts are ready in 4 to 7 days, microgreens in 7 to 14 days, and baby greens can take 3 to 4 weeks or longer depending on seed type. Sprouts and microgreens are often used to garnish dishes, and baby greens to create salads. I grow all three, but I particularly love microgreens for their fast growth, variety of textures, and culinary uses. And, their nutritional content can be 4 to 40 times the amount of their full-grown counterparts. All you need are a few black plastic trays that you brought plants home in from the garden center, soil-less potting mix labeled for vegetables without water holding crystals, and seeds for planting. 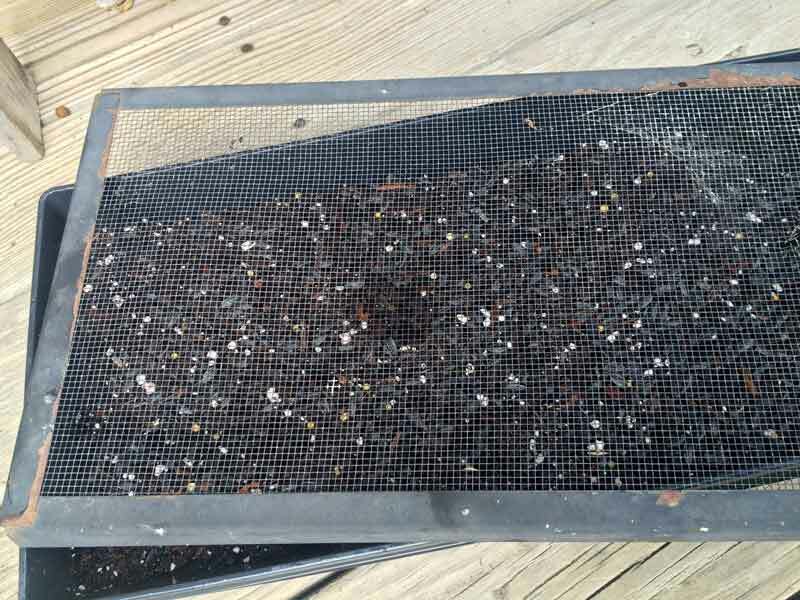 You need a tray with drainage holes for the soil, and then one to put over the soil tray while seeds are germinating. It also helps to have a tray without holes underneath the soil tray to keep the soil and water from leaching out onto your porch. 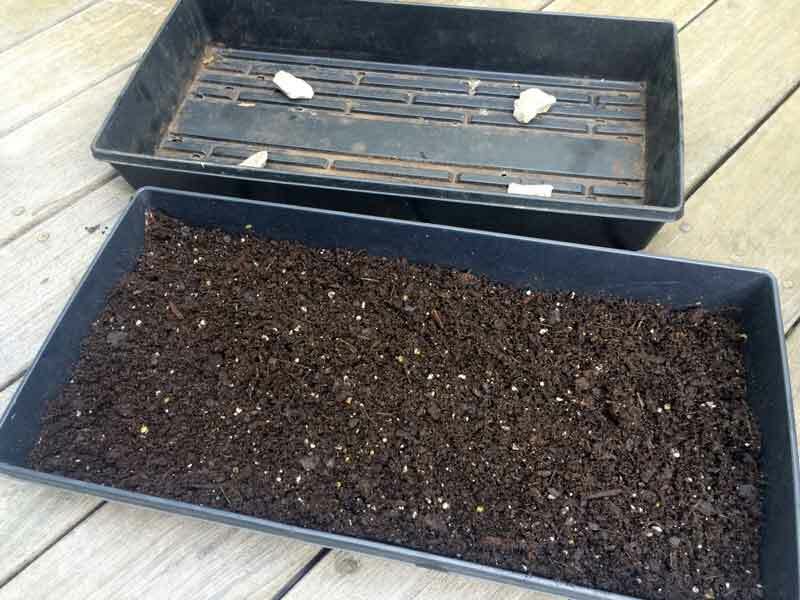 You can set the soil tray on top of stones inside the bottom tray for more airflow and drainage, but is not necessary. I would also recommend a screen of some kind to put over the growing microgreens if you have pesky squirrels. 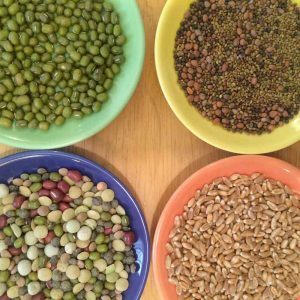 Seed choices for microgreens are so numerous and colorful they are often called “vegetable confetti.” However, you need to make sure any seeds you are growing have not been treated with pesticides. If you are uncertain, purchase them from a reputable source of sprouting or microgreen seed supplies. I fell in love with sunflower shoots, and bought organic seeds at a local garden center. They have a coarse texture, add a nice crunch to dishes, and grow well in hot weather. 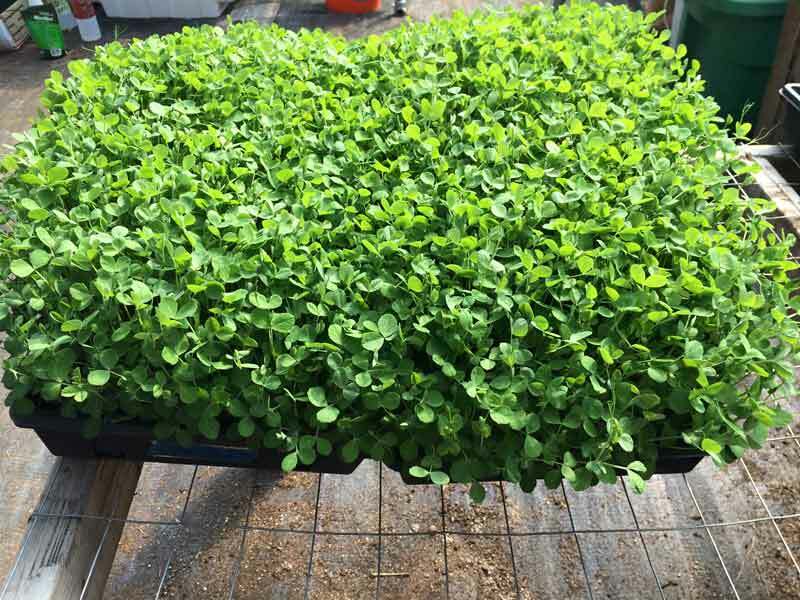 Pea shoots are another large-seeded option that produces a lot of growth but does better in cool weather. 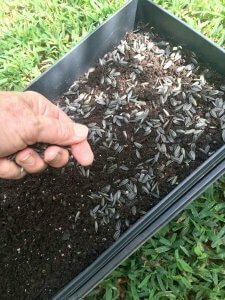 Unless you are growing indoors in a controlled environment, choose seeds that fit the growing season. Put 1 to 1½-inches of potting soil in the tray, and scatter the seeds thickly over the soil. Large seeds will be almost touching, while smaller seeds might be at 10 to 12 seeds per square inch. If they are seeded too thickly, they will be more prone to disease and if they are seeded too thinly, you won’t have much harvest. Some people recommend soaking seeds first but I’ve had both methods work well. Cover the seeds super lightly, if at all, with a fine layer of potting mix and water gently. The goal now is to spritz with water twice daily and add a little more water in dry weather—but you want damp, not soggy, soil. Once planted and watered in, cover the tray with the other black tray for a day or two until the seeds are hydrated and starting to sprout. Remove the black cover tray, and replace it with a screen. I use one we had from an old aquarium or you could get some screen cloth from the hardware store and make your own. At this point the sprouted plants need at least four hours of sun a day or a grow light to get their full green color. In super hot weather, limit sun exposure to the morning hours. 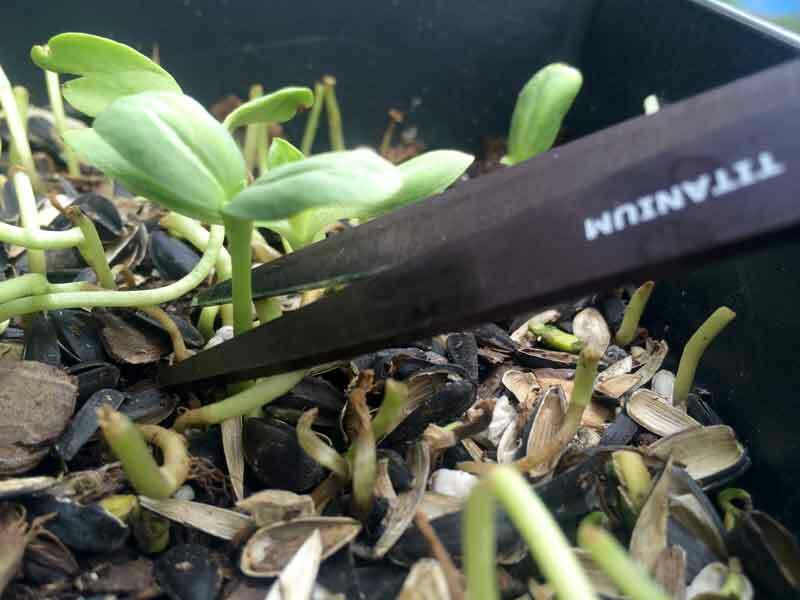 After 7 to 14 days use scissors or a sharp knife to cut the microgreen seedlings off just above the soil line. Store them in a bag or container in the refrigerator and rinse before eating. They should keep several days to a week at least, depending on the type of seed. Some people reuse the soil after harvest but disease pressure will build and generally it’s best to toss it in your compost pile. Rinse the tray well, and put new soil in for your next batch. -Lettuces are not ideal for microgreen plantings as they are too soft and wilt easily. -Look for seeds labeled as mild or spicy, flavorful, sweet, colorful – often sold as mixes. -Fast-growing: radish, cabbage, mizuna, mustard, collards, kale, kohlrabi, sunflowers. -Flavorful but slower growing: basil, onion, chive, fennel, lemongrass, garlic, celery, parsley, cilantro. -Warm season: buckwheat, sunflowers, popcorn, amaranth, beans. -Cool weather: spinach, peas, carrots, cress, mung beans, brassicas (kale, cabbage, etc), radish, beets, Swiss chard. -Wheatgrass is great for juicing.